Ken Wheeler sets up a frame in his shop in Southeast Portland. 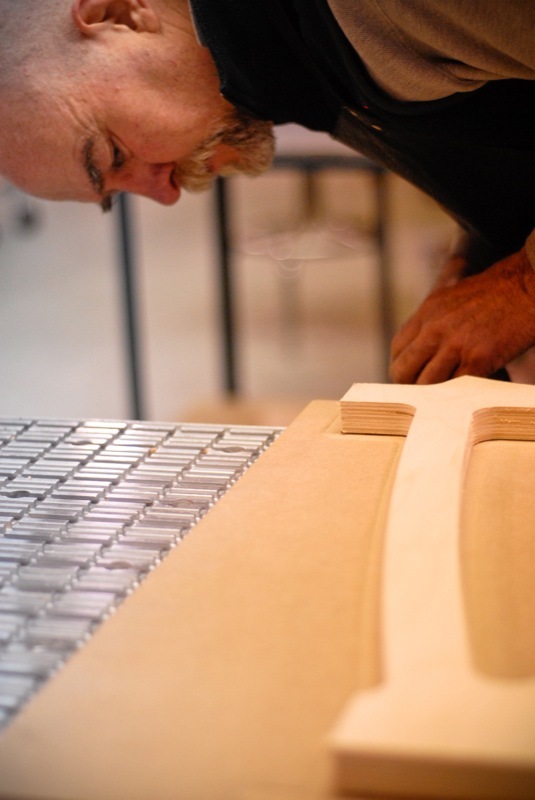 Ken Wheeler is teaching an old material new tricks — and in the process, he’s doing something that is literally on the cutting edge of framebuilding. 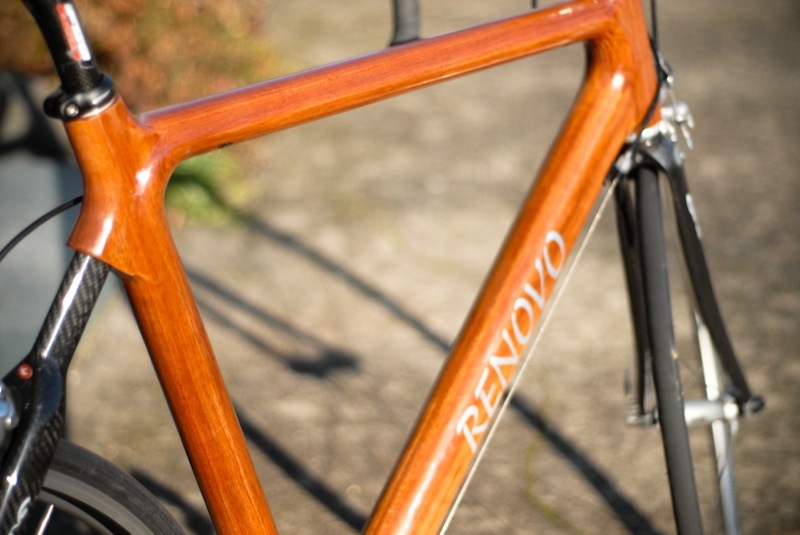 Wheeler, under the name Renovo Hardwood Bicycles, is producing hollow, monocoque bicycle frames out of exotic hardwoods using a CNC machining process (CNC on Wikipedia). After I noticed his name on the list of exhibitors for the upcoming North American Handmade Bicycle Show (NAHBS), I had to pay him a visit. What I saw was surprising and impressive. 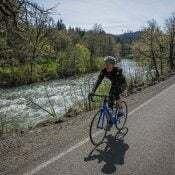 Wheeler, who has ridden bikes his entire life, is the former owner and CEO of a 75-employee business that designed and produced composite airplanes in Gig Harbor, Washington. 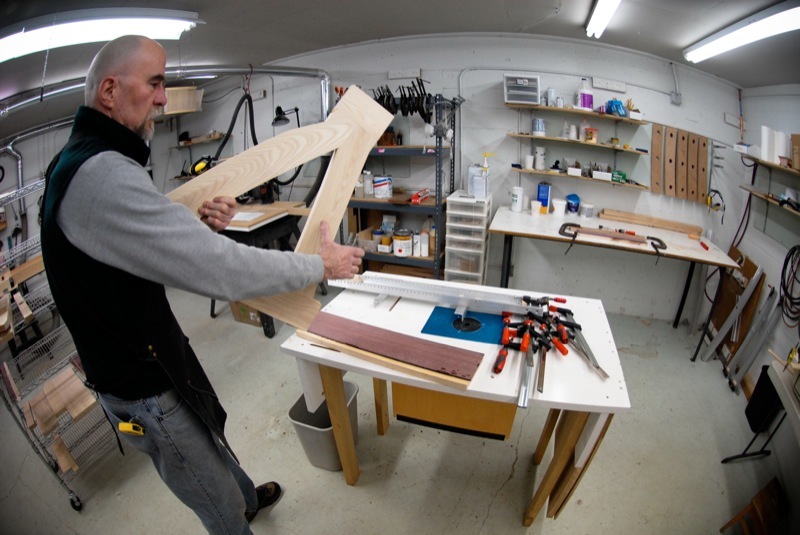 Three years ago, he moved on from that company and came to Portland (from Seattle) to start up a wood carpentry business making high-quality, wooden camp kitchens, fly-fishing tackle boxes, and other items. 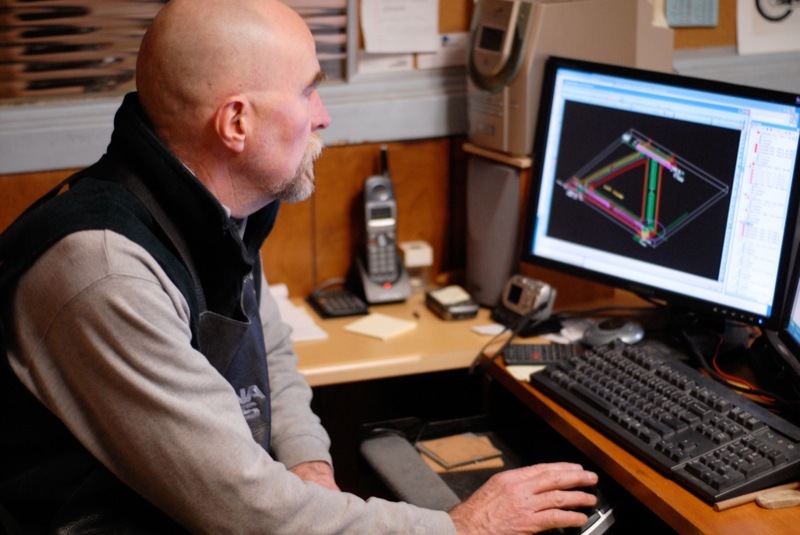 Wheeler is no stranger to high-end wood and metal fabrication. While touring his shop, he pointed out a poster of Italian-made “Falco” wooden airplanes that he admires and he is a veteran aircraft mechanic with years of metalwork and welding under his belt. 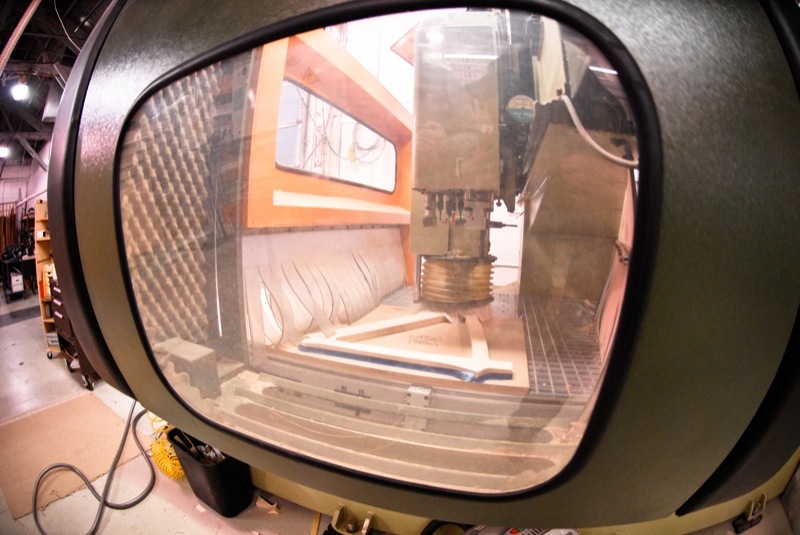 Also during my visit, I watched Wheeler do a test run on the CNC machine (he runs plywood through first to make sure his calculations are accurate). I was stunned. I watched a CNC machine hover over the slab of wood with hard edges and no finish work yet done on it. 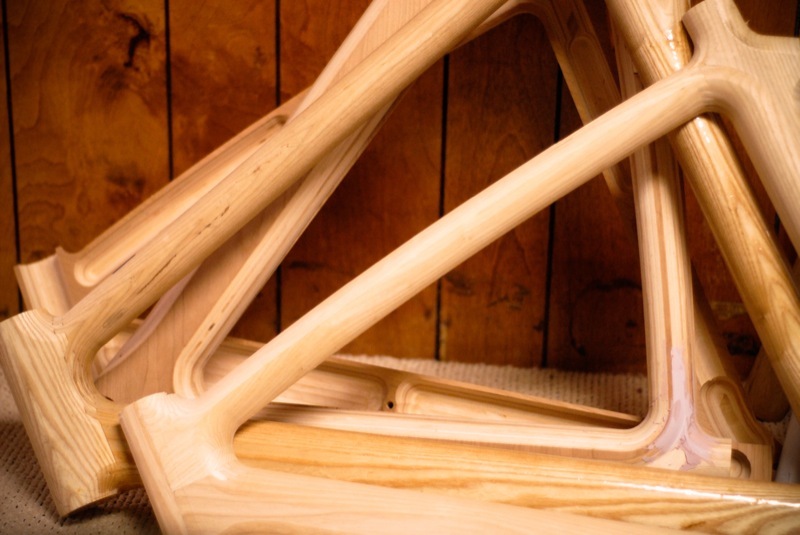 It whirred and cut with absolute precision, perfectly rounding edges and hollowing out the wood. that runs the CNC machine. This was a stark contrast to the painstaking work I’ve watched in other local shops, where framebuilders hunch over one weld, tirelessly sanding steel for hours on end. Was I witness to the beginning of a framebuilding revolution? 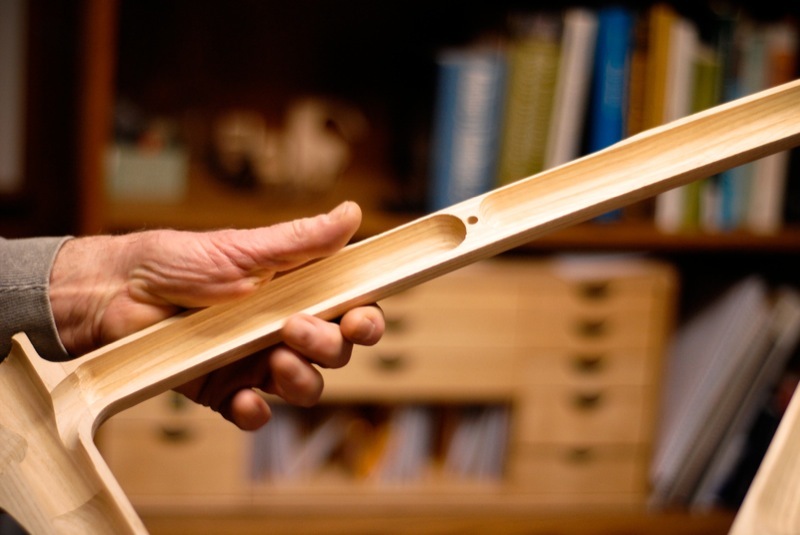 He’s put his wooden tubing samples up against Easton aluminum. The result? “We beat aluminum every time,” Wheeler says with a smile. Wheeler has big plans for Renovo. 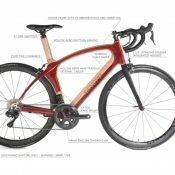 “The way these are made lends itself to high volume production.” He’ll debut them to the world tomorrow at the NAHBS, and he plans to attend Interbike later this year. 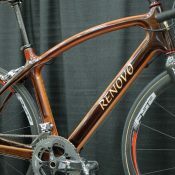 Check out RenovoBikes.com for more information. Those bikes are beautiful! very nice job Ken, I am impressed. Wow! Man, that is all I can say. Just wow! So I have a geek question. How does he not split the head tube when he presses in a headset? Is there a metal insert? tonyt – You guessed it, there\’s a metal insert. 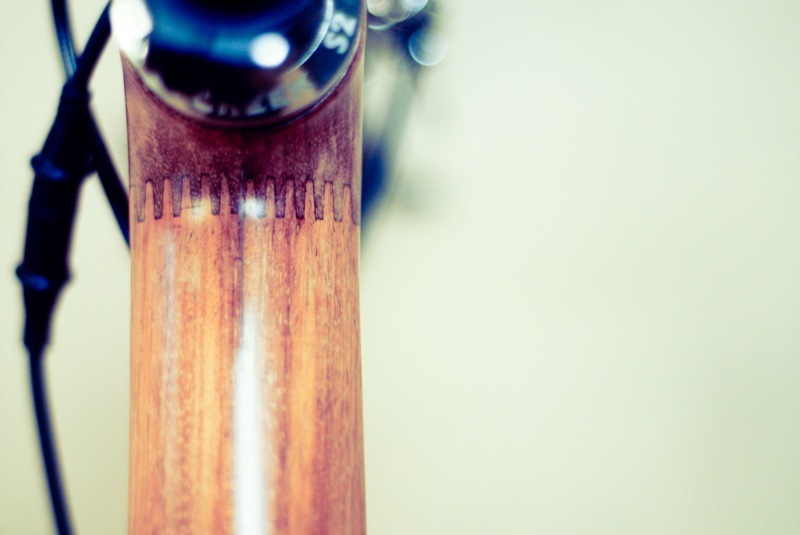 It\’s a titanium sleeve that goes all the way through the headtube. I pressed in two of the headsets just this evening during last minute preparations for the show. It was a nice tight fit, and the cups slid in smoothly. You should see the headsets he chose, they\’re beautiful. Polished titanium with wood inserts, they complement the frames nicely. I was lucky enough to take a short test ride on one of the earlier prototypes last year. The ride quality was impressive. The bike was stiff enough for good power transfer, but smoother than any steel or carbon I\’ve ridden. What the heck? Do they let Marines ride bikes, Lt. sir? Well Stu, do they?? “We beat aluminum every time,” Wheeler says with a smile. kamajii you obviously haven\’t heard about the paratroop Marines being issued folding mountain bikes starting back in 2001. The clincher was an execise where marines with the folding MTB reached their objective from an insertion point hours faster than the squad on foot, no more tired than the foot squad and were just as effective in the simulated battle as the foot squad. And the bike squad was just as stealthy as the foot squad, too. Pity there are so few opportunities to use the bike-equipped Marines except in Afghanistan. Do you have a link to that article/report, Opus? And the precision of CNC, which I\’m also familiar with, is a match made in heaven. I\’ll see if I can dig that report up a.O definitely an interesting read. a.O. this was all I could find off the bat: http://www.combatreform.com/atb.htm Lots of mission reports on that site, which is devoted to the history of the bicycle in war and combat. a.O. 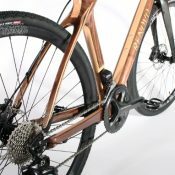 this is the manufacturer\’s web site http://www.militarybikes.com/military.html These are the same guys that make the HUMMER folding bike (which is based on the same technology). I think this discussion probably belongs somewhere else than this thread. This makes me very sad, not just for mr. Wheeler but because it is another signpost along the road telling us our fair city is quickly turning from a community of Artisans, Bikebuilders, Musicians and Brewers into a burg of clerks, call center staffers, orderlies and real estate hustlers.Perhaps it is the March of progress, or just the realities of the costs and requirements of the modern world. But darn I miss the days when everyone I met did something cool for a living and got everywhere on a bike.